“You should do it!” said her boyfriend, Declan. It’s all his fault apparently. In the humble beginnings of her parent’s home, the planning of Lisa’s exciting new business began. She started selling cakes and cookies to local cafes and hosted a stall at weekend farmer’s markets. I don’t know how their oven wasn’t worn out as things took off fast! Her specialty was cupcakes, which at the time was quite new to the UK, and people loved them. Wedding cupcake orders began flooding in as brides were keen to stand out from the crowd with their chosen cake. The Little Cake Parlour was ahead of the curve on this one, maybe even the cupcake trendsetter. Things progressed quickly and Lisa found herself doing less wholesale and more bespoke orders. In 2008/2009 she did 60 cupcake wedding orders alone! With more space required to bake and a place to meet and consult with all her new wedding clients; in late 2009, The Little Cake Parlour shop in Pollokshaws, Glasgow was opened. The cupcake craze was at its peak at this point. Due to the success of the shop, Lisa was run off her feet with queues out the door. “It was mad”, she says. The dream of opening a quirky cake shop in Glasgow had been achieved. And she doesn’t just make cakes for the ‘average Joe’ either. Providing the cakes for the MOBO awards has been a highlight of her career with My Chemical Romance, McFly and Ed Sheeran also featuring among her star-studded clientele. Some of Lisa’s beautiful cake creations on display at her studio. 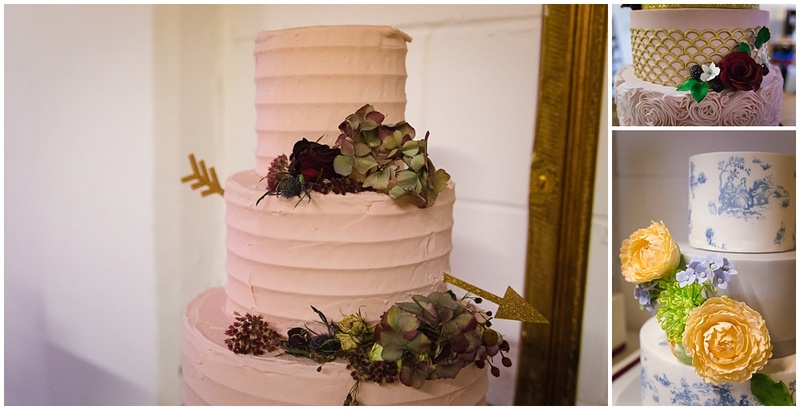 In April 2014, she had over 20 wedding cake orders to make in that month alone as well as the shop to bake for. Her public facing shop was now becoming a distraction rather than an asset and it was time to fully concentrate on the bespoke orders only. In January 2015, she closed the shop and relocated The Little Cake Parlour to a large studio space in The Templeton Building by Glasgow Green. She set about looking for some studio roommates and now Studio 408 hosts 4 different small wedding businesses; Lisa’s Little Cake Parlour, Sophie at I Heart Flowers, Cat at Cat Robertson Makeup and Gillian at Pin Up Hair. When I ask her what her favourite part of running a business is, her face lights up. “Meeting clients and hearing all their wonderful ideas! They’re always so nice and it’s really fun.” Lisa really is such a people person (our 5-hour chat can attest to that!). She just loves to hear all about you so that she can make a cake that will be perfect for your wedding or special occasion. She’s so passionate that your cake should be yours, and not interchangeable with anyone else’s, that your cake is guaranteed to be utterly unique. The many thank you cards from Lisa’s thrilled clients! Lisa’s advice for any small business is to either “grow, or stop.” These are wise words and Lisa never stops. In fact, she is so hard working that she says working 10am to 10pm would be a good day for her. Her incredible commitment makes sure that her business is always at the top of its game. The Little Cake Parlour recently celebrated their 10-year anniversary, a mighty feat for any business. I’m not surprised as there doesn’t seem to be anything that Lisa can’t turn her hand to. As I ogle at her sample cakes, I enquire about the intricate designs. And yes, she hand-painted those cake designs herself. And yup, she also did the calligraphy lettering too. “It’s not hard,” she says. I can’t even draw a stick man, so I’m completely in awe of her many talents and also struck by her modesty. Lots of inspiration awaits you at your cake consultation! Our Lisa was a bit too shy for a portrait of herself. So instead, we’ll just have to settle for photos of her tasty creations. Many thanks to Lisa for sitting down with me and taking the time to tell me more about her tasty wares. I’m sure you’ll agree they look freaking amazing. So, what are you waiting for? Get an order of cupcakes in pronto – and send me some of them! Any advice for couples who are wedding cake shopping? It’s better to go small and unique rather than big and bland. Get something that looks amazing, tastes amazing and fits your planned spend. Don’t worry about anything else, like trying to figure out what flavours everyone will like. Vanilla is always popular! Also popular are chocolate & caramel and red velvet. What was big in 2016 cake trends? Rose gold, blush pink and ruffles. What do you foresee for 2017 trends? My 408 studio friends! I Heart Flowers, Cat Robertson Makeup and Pin Up Hair and Gioia Mia for Jewellery.